Milford Township engages on an ongoing road maintenance program. Infrastructure activities like this ensure that the roadways are kept safe and passable. Road maintenance includes stripping and re-paving roads, sealing cracks, laying down oil and chip (which helps with storm water drainage), road and intersection widening, and installing storm water drainage along roadways to prevent flooding. Snow and ice control is a central winter activity of the Milford Township road crew, especially during a rough winter. Milford Township is responsible for keeping 76.45 miles of roads passable whenever winter weather strikes. Our crews work hard day and night to treat the roads even in the worst weather conditions, blinding snow, crippling ice, sub-zero temperatures, often sacrificing time away from their families on weekends and holidays. These winter warriors prepare for each snow season beginning in October with a week of extensive safety training, plus equipment and maintenance reviews. All drivers review plow blade replacement, tire chain utilization, emergency procedures and detailed safety inspections. Most drivers retain the same route from one winter to the next and are familiar with their routes. This is particularly important when snow is deep and drifted. Knowing the roads and all landmarks is critical when it is impossible to distinguish where the road is located. When winter storms become imminent, staff carefully monitors the storm’s movement on radar and consults different weather forecasts to track of ground conditions and approaching storms. This enables us to quickly mobilize our crews and equipment minimizing response times. Milford is well equipped to handle the severe weather that has come our way. 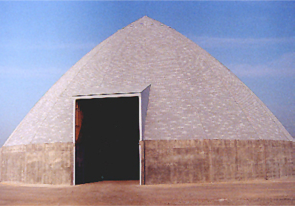 Our salt shed provides storage to meet our needs, but severe conditions can cause us to keep strict oversight on our contracted deliveries. 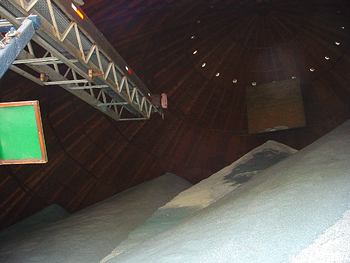 Nationwide salt shortages have been a recurring problem during harsh winters when salt demand runs high. Delivery issues can also crop up like they did in 1994 when the Ohio River froze preventing salt barges from being able to reach the Port of Cincinnati. Milford’s snow-fighters work shifts to keep roads clear by salting or plowing, depending upon conditions. 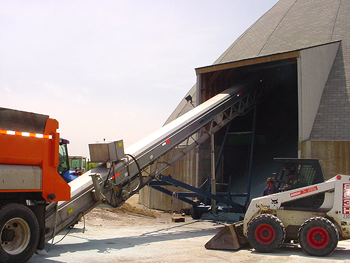 Snow and ice control routes ensure that every road is treated quickly and efficiently. Severe, crippling snowstorms, although rare, do occur here in southwest Pennsylvania. The area is also prone to occasional ice storms which can be treacherous and sometimes deadly; however, more typical are the light to moderate snows in the one to six inch range that fall and make road surfaces hazardous just the same perhaps more so because many motorists don’t treat these conditions as seriously. When heavy snow or ice does occur, a Snow Emergency may be declared necessitating limited or restricted driving conditions. Motorists can check this web site for Snow Emergency postings, reports on local and statewide road conditions, plus links to forecasts and radar. Mailboxes are sometimes damaged when plowing occurs. On most occasions, they are knocked down NOT by the plow itself, but by the force of the snow as it is being pushed aside. However, most mailboxes, if sturdy and properly installed, will withstand this force. While government agencies are not required to replace damaged mailboxes that sit on public right-of-way, Milford may choose to replace mailboxes as a courtesy. Re-application of lettering and numbers is the responsibility of the homeowner. When clearing your driveway, try to pile the snow to the left side as you face your house, specifically when clearing near the road. This will prevent the plow blade from dragging the pile across the front of your driveway. Remember, it is illegal to push snow into the road. Doing so constitutes obstruction of the roadway and can be dangerous to motorists. Please, do not push snow into the road. Specialized equipment is necessary to build and maintain the vital infrastructure for our community. Clearing snow from roads, paving, mowing open space, and creating necessary storm water drainage are some examples of operations requiring the proper equipment to build and maintain our township. Milford Township pursues a modest equipment purchasing program in order to give our road crew the necessary tools to beautify and maintain our community.